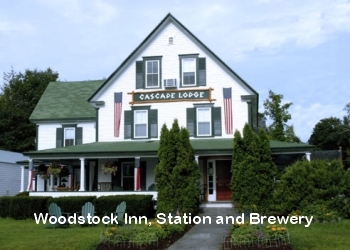 Located in the heart of the majestic White Mountains, the Woodstock Inn, Station & Brewery is one of New Hampshire's most visited country inns. The Inn's gracious and relaxed setting centers around 33 guestrooms, each individually appointed with cable TV, air-conditioning and in-room telephones. Grand rooms offer Whirlpool tubs and gas fireplaces. 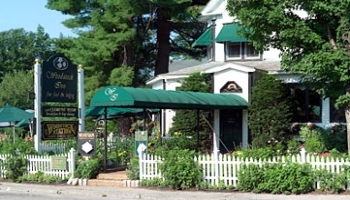 All room packages at the Woodstock Inn, Station & Brewery include a hearty country breakfast in the casual elegance of the Clement Room Grille � known for "The Best Breakfast in the Valley." The Clement Room serves an innovative, sophisticated menu for breakfast and dinner. Retaining its historic sensibility, neighboring Lincoln's original train depot has been preserved and incorporated into the Inn's main building. Woodstock Station serves lunch and dinner with an informal menu jam-packed with a mouth-watering assortment of tasty appetizers, homemade soups, sandwiches, burgers and delectable entrees. Distinctive variety, hearty portions and live entertainment make "The Station" an enduring favorite with locals and visitors alike. 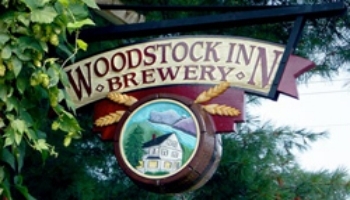 An important part of the Inn's character, the Woodstock Inn Brewery consistently offers a premium selection of freshly brewed ales from its seven-barrel brewing system. The cozy Brewpub allows guests to socialize over a pint, watching brewers hard at work perfecting their handcrafted ales. In the summer explore the regions many attractions and places to see. Take a hike, drive along the many scenic highways, see Moose or just relax and enjoy the beauty. In the winter, skiers and boarders alike love the slopes of Loon, Cannon, and Bretton Woods. Meticulously handcrafted right here at our own NH brewery, our ales are made from only the highest quality ingredients. Our traditional seven-barrel system employs premium hops from around the world blended with imported English grains and brewed with pure, deep-well water to produce a superior selection of seasonal ales. Stop by the Brew Pub for a pint and take a few minutes to watch our brew masters at work. If you can't decide which of our specially crafted brews to try first, try our Brew Sampler � we'll serve you four 5-ounce glasses of your choice of beers. Or, find one you really like? Take home a half-gallon Growler jug (some brews not available "to go") or check here for where to pick up bottled 6-packs of Red Rack, Pig's Ear, Pemil Pale Ale, Loon Golden Ale, our current Seasonal, and the White Mountain Variety 12-pack in stores.